While not as stylistically apparent as Kim Jee-woon’s The Good, the Bad, the Weird (2008), Kundo: Age of the Rampant by Yoon Jong-bin is the second high budget Korean film made using western conventions. The film’s plot is firmly embedded in the late Joseon period and deals with a gang of thieves (called Kundo) that acts on behalf of the poor. Bit too Robin Hood? Perhaps, but compared to the merry men in tights, Kundo’s heroes are more obviously badass. I knew that the film would fall to my liking. The reason for this could be Ha Jung-woo, whose previous performances in Kim Ki Duk’s Time and Na Hong-jin’s The Chaser blew my mind. This time he really came out of his comfort zone by playing a young and strong-handed butcher called Dolmuchi. Dolmuchi is promised a significant reward by a local lord for the task of killing a prostitute who hides in the nearby Buddhist temple. It turns out, however, that Jo Yoon (Gang Dong-won) wanted to kill his pregnant sister-in-law, whose child could jeopardize his position in a clan of landowners. Dolmuchi’s consequent reluctance to kill the woman results in Jo Yoon ordering the removal of the butcher and his family. Miraculously, Dolmuchi survives the house fire and vows revenge on Jo Yoon. Arrested and sentenced to death, Dolmuchi awaits his fate in prison. 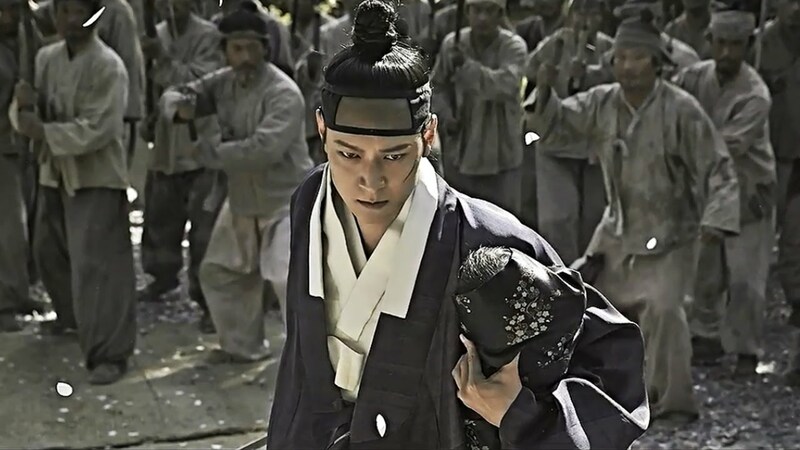 While being lead to his death, he is saved by a group of men and transported to Jiri Mountain, where they invite him to join their gang of thieves in robbing the corrupt warlords, such as Jo Yoon, to give back to the poor. After two years of training, Dolmuchi is reborn as the butcher’s-knife wielding, bald and bearded Dochi. The characteristic melodies, written by Cho Young-wuk (Oldboy), are reminiscent of Ennio Morricone’s work. Kundo: Age of the Rampant nicely balances elements of Westerns and Sageuk, such as galloping into the sunset, municipal corruption, and the poverty of the people in the late Joseon period. It is an electric mixture for sure; nevertheless, everything is tied together by the narrative voiceover, which, in Kundo at least, defeats the more usual redundancy by quickly outlining the backgrounds for the characters. I assumed, while watching teasers, that Jo Yoon would go against his father by joining the gang of thieves and fight alongside Dochi. It turned out that Jo Yoon is the main antagonist in the film who only kills, seizes land, forces people into slavery and makes himself rich. Jo Yoon isn’t an anti-hero, but a classic aggressive, cold-hearted and unscrupled villain very well acted by the young Dong-won (Duellist). This was Gang’s first role since leaving the army, so it was good to see him having decent screen time. A simple division between black and white is a classic indicator of a western, and two great actors playing the main characters on both sides of the conflict definitely added to the film’s attractions. Fortunately Kundo: Age of the Rampant doesn’t forget to provide great entertainment. It is a multi-threaded film with a very broad cast: wonderful Ye-ri Han as tough Gok-ji, Lee Geung-young as Ttaeng-choo and Lee Sung-min as gang leader Dae-ho. They all briefly outline a fairly rich world with a touch of black humour here and there. I think Ha Jung-woo’s portrayal of Dolmuchi is one of his best performances in the past few years. Not because his performance in The Berlin File or The Terror Live or any of other films was bad, but because it was his first non-thriller role in two years. There is something extraordinary about Ha Jung-woo’s style of acting that always gives shivers to his audience members. I am not surprised that Jung-woo is one of the most sought-after actors in Korea. Choi Chan-min’s cinematography (71: Into the Fire) and the visual effects by Kang Chang-bae (Snowpiercer) beautifully brought the protagonists’ story to life, while the fight scenes coordinated by Jung Doo-hong were invigorating. I must admit I enjoyed the film throughout, and it is definitely worth seeing on the big screen.